To improve the application development experience, the Pega 7 Designer Studio has been redesigned to provide a cleaner interface and improve access to the tools that application developers use most to create and test application functionality. PRPC 6.3 application developers can download and print a four-page Quick Reference Guide to help navigate the Pega 7 Designer Studio. This Quick Reference Guide identifies the approximate Pega 7 equivalents for PRPC 6.3 Designer Studio features. The Designer Studio incorporates the responsive UI capabilities and HTML5 compatibility provided in Pega 7 to support multiple browsers, platforms, and display sizes. This allows the Designer Studio to automatically adjust to fit the available display area, while still providing access to critical functionality. The Landing Page menu replaces the Pega menu, and provides access to many of the landing pages and tools used by application developers. Some categories and landing pages have changed in Pega 7. For a full inventory of landing page changes, consult the Quick Reference guide. The contents of the Application menu have changed to reflect the removal of the Application Profile wizard and Application Accelerator in Pega 7. In Pega 7, Application Express incorporates some of the functionality provided by the Application Profile wizard and Application Accelerator. Other functionality has been replaced by Pega 7 features, allowing application developers to gather requirements and specifications and document existing processes from within the application. For more information on the changes to DCO in Pega 7 and how these changes affect the design and configuration of applications, see Managing your application profile from the Application Overview landing page. The Operator menu moves to the right side of the Header, and now allows an operator to log out, in addition to the options available in PRPC 6.3. Most Quick Launch toolbar options are incorporated into the Designer Studio Header. The Recent Rules and Favorites features are now available in the Explorer Panel. The features formerly available on the Run menu are now available elsewhere in the Pega 7 Designer Studio. The Clipboard and Tracer now appear on the Developer toolbar for quicker access. 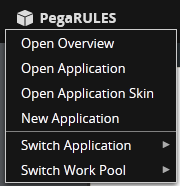 The Rules Inspector is named the UI Inspector in Pega 7, and now appears on the Developer toolbar. My Alerts is named Alerts, and now appears on the Developer toolbar. The Run Process submenu now appears in the Header as the Create menu. The Open Portal submenu now appears in the Header as the Launch menu. Click the Recents icon to list the records recently viewed by the current operator. This list mirrors the contents of the Recent Explorer. Click the My Checkouts icon to list the records currently checked out by the current operator. This list mirrors the contents of the Private Explorer. 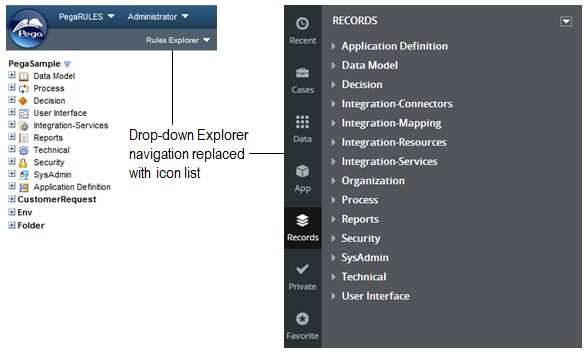 The Explorer Panel in Pega 7 provides several new ways to view and manage records, and collapses to provide a larger Work Area on smaller displays. The Recent Explorer mirrors the contents of the Recent Items menu in the Header. The Cases Explorer lists all of the cases defined in the current application. Selecting a case opens the Case Designer, which incorporates the functionality of the PRPC 6.3 Case Designer. The Application Explorer incorporates the functionality of the PRPC 6.3 Class Explorer. The Data Explorer lists the data pages (known as declare pages in PRPC 6.3 and earlier versions) defined for the current application. The Rules Explorer has been renamed the Records Explorer. This name change reflects that the explorer lists both rule and data instances. The Private Explorer and Favorite Explorer replace the My Rules Explorer from the PRPC 6.3 Designer Studio. The Private Explorer lists the rules currently checked out by the current user, and mirrors the contents of the Checked Out Records menu on the header. The Favorite Explorer lists rules marked as favorites for the current user. The new Developer toolbar provides one-click access to several frequently used developer tools. The Clipboard, Tracer, UI Inspector (formerly the Rules Inspector in PRPC 6.3 and earlier versions), Performance, and Alerts (formerly My Alerts) tools are now available with a single click, eliminating the need to navigate menus to access and configure each one. The UI Inspector now documents both property and UI rule references by default. Selections on the Inspection Prefs menu enable the identification of declarative and field value rules as well. The Work Area of the Pega 7 Designer Studio contains numerous layout, default content, and navigation enhancements designed to improve usability for application developers. 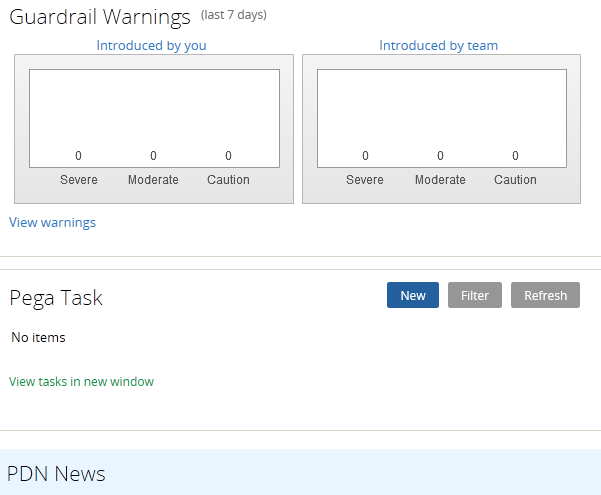 Upon logging into PRPC 7.1, the Home page presents business architects and system architects with guardrail warnings for the current application, outstanding development tasks, and new content from the PDN. The Pega 7 icon in the Header allows application developers to return to the Home page at any time. When editing a record, the form header now allows users to update the short description, availability, and status of that record. The actions available in the header update to reflect the current state of the record. Lock information for a rule can be viewed by hovering over the lock icon in the rule header, allowing application developers to identify why a rule cannot be edited.